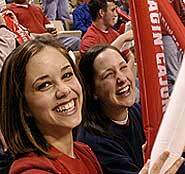 The University of Louisiana at Lafayette Alumni Association will honor two Outstanding Alumni during Homecoming 2006 Week. Dr. Gordon Bernard and John McDonnell are the 2006 recipients of the Outstanding Alumni Award. The Outstanding Alumni Award is the highest honor the university bestows upon a former student. It is given in recognition of outstanding professional and personal achievements that have brought honor and distinction to the University of Louisiana at Lafayette. To be eligible for this award, one must be a graduate or former student having attended no less than 10 years ago. The recipients were selected by the Alumni Association's Awards Committee. They will participate in a number of Homecoming activities. Bernard is Assistant Vice-Chancellor for Research and Director, Division of Allergy, Pulmonary and Critical Care Medicine at Vanderbilt University. McDonnell is the legendary head coach of the University of Arkansas cross country and track and field teams. Bernard is a 1972 graduate of UL Lafayette where he earned his bachelors of science degree in biology and chemistry. The Melinda Owen Bass Professor of Medicine received his medical degree from Louisiana State University in 1976. After internal medicine training at the University of Kentucky, he became a Parker B. Francis Fellow in Pulmonary Medicine at Vanderbilt in 1979, where he did his initial research training. In 1987, he was appointed assistant professor in the Department of Medicine at Vanderbilt and later became professor and interim chief of the Division of Allergy, Pulmonary and Critical Care Medicine. Bernard is a member of many professional societies and has received numerous honors. He served on the advisory council for the National Heart Lung and Blood Institute (NHLBI) and was the NIH Steering Committee chairman for the NHLBI ARDS Clinical Trials Network. He has either contributed or written more than 250 journal articles, book chapters and editorials about his field. He is married to Yvonne Delahoussaye and they are the parents of four children, Aline, Ben, Jacques and Claire. McDonnell is the current head coach for the University of Arkansas Razorback cross country and track and field teams. During his tenure with the Razorbacks, the track team has won 42 NCAA championships, which include 11 for cross country, 19 for indoor track, and 12 for outdoor track. As coach, he has more national championships than any coach in any sport in the history of collegiate athletics. McDonnell has coached all but three of the university's 161 track All-Americans and he has coached 23 Olympians, which include a gold, silver and bronze medallist. At the university, the outdoor track facility is named for him and he is the member of the United States Track Coaches Hall of Fame, the University of Arkansas Sports Hall of Honor and the University of Louisiana at Lafayette Athletic Hall of Fame. McDonnell is a 1969 graduate of UL Lafayette, earning a bachelor of arts degree in Education. He has coached at the University of Arkansas since 1972 where he has been named the District Coach of the year 60 times, Conference Coach of the Year 45 times and national Coach of the Year 30 times. He is married to Ellen Elias and they are the parents of two children, Heather and Sean.